The Disability Discrimination Act stipulates that buildings used by the public need to be accessible for people with a disability. This means that even if there are no disabled persons in your congregation, you may still need to make allowances for disabled visitors. The term ‘disability’ applies not only to those in wheelchairs but also people with impaired vision or hearing, or even those who have suffered a temporary injury and require mobility assistance (such as someone using crutches). It’s important that people with a disability not only have access to enter the building but are also able to participate in activities if desired. Some organisations may be exempt from making building adjustments if it would cause excessive difficulties and costs. This is known as ‘unjustifiable hardship’ and it is up to the organisation to show that provision of access would cause too much hardship and not be justified. Car-parking spots close to the building entrance. Walking paths – these need to be as flat as possible and to be free of trip hazards. Installation of ramps – for buildings that have steps to the entrance. Door-opening width – to allow for wheelchairs. Visual aids – such as tactile indicators near stairways. An audio induction loop system to assist hearing-impaired individuals. Large print on newsletters or other notifications. Ensuring print media is clear and easy-to-read without excess content. Provision for wheelchairs in the main seating area. Provision for guide-dogs if required. Arrangement of furniture – in the foyer area for example. 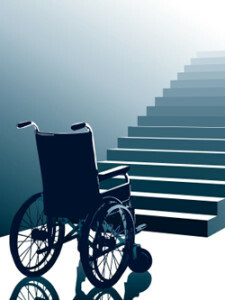 Procedures for evacuating disabled persons in an emergency. Equal access to all information. For more information, go to the Australian Human Rights Commission Disability Rights page here.